There are 25 county high points in Ireland. Some counties happen to share a high point which made the challenge of climbing them all in 12 months seem a little bit more do-able! 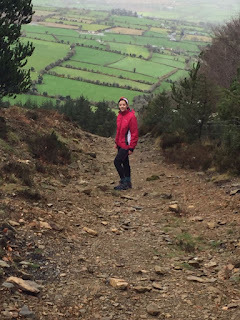 I am not sure when it went from 'let's climb Mount Leinster' on a clear Saturday morning to 'sure why don't we all 25 county high points' (hereafter CHPs) - but it has and so we will! I bought a great little guide book called Ireland's County High Points by Kieron Gribbon. It gives tips and routes for climbing the peaks and most helpfully - it gives the sat nav coordinates to the best place to park and start the climb - when undertaking a challenge like this it is imperitive that you don't fall out with your climbing buddies while trying to navigate to the carpark! We started off with Mount Leinster. CHP of Wexford and Carlow. 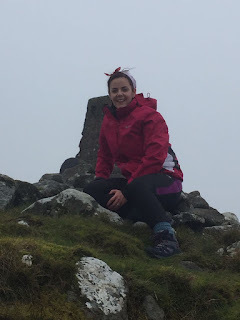 I would love to say it was spectacular and the views were amazing but it was snowing as we started the walk and by the time we got to the top you could see about 10 feet in front of you and that was about it. Everything was pure white - a winter wonderland! Since that we have climbed Brandon Hill, Kilkenny CHP. The views were much better in that there were views to see! I did have to go on hands and knees to the trig point at the very top because the wind was so strong. So that's how the story starts and we will learn as we go. The very good people of The Irish Experience have invited us to Waterford on Saturday to learn some mountaineering skills and I am so excited to learn from the experts! Watch this space for a full report!